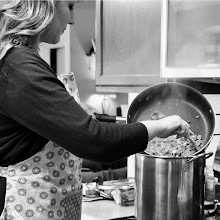 I usually buy thick sliced boneless pork loin, I have also used regular pork chops bone-in, it would probably even work with a pork roast...not sure, I haven't tried that. 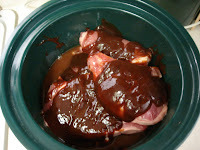 -Pour 1 to 1 1/2 bottles of your favorite BBQ sauce over the top. I use hickory flavor. Then, sometimes if I remember I throw a whole peeled onion in. Doesn't really matter. -Pour about 1/2 can of soda over that...I know, weird, huh. My original recipe called for coke. I use Sprite or 7-up. 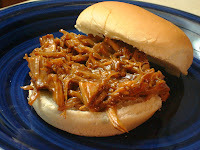 -Put the lid on, put it on high for about 6 hours or low for about 10.When I pull the pork out to shred it is usually very easy to take two forks and almost mush it apart on a plate. If it's too hard to shred, it hasn't cooked long enough. If you used pork chops with bone, be very careful to remove all the bone pieces. 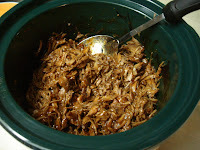 -Discard the liquid (and the onion if you used one) and return meat to crockpot, then add another bottle (or more) of Hickory BBQ sauce to the meat and stir it all in. You may wish to put the crockpot on low to keep the meat warm. It's really easy. We always have this for New Years so I don't have to cook and it can sit in the crock pot all day so we can all eat whenever we feel like it. I like the in progress pictures!